>>THURSDAY SPECIALS<< Available THURSDAY Only- Open Face Hot BEEF BRISKET Sandwich from 11am-9pm. PRIME RIB Dinner 4pm- 9pm (or til sold out) Open Face Hot Beef Brisket Sandwich is Chopped Beef Brisket served up open face on Texas Bread with garlic mashed potatoes, gravy and vegetable. Nothing like a home cooked meal! PRIME RIB Dinner includes our well seasoned and gently smoked Prime Rib and includes your choice of potato, a vegetable & salad bar. Original 12 oz Dinner $16.95 Big Cut 16 oz Dinner is $21.95 Take the day off and let us do the cooking! It's the time of year for Graduation Parties, Family Reunions, Weddings and More! If you have an event coming up, give us a call. We can provide you with every level of service from bulk food pickup at our West Salem location to full service catering. Big Boar BBQ & Catering is here to make planning your party easier and provide you with great food to make your party a success! Give us a call or check out our website for more information. https://bigboarbbq.com/catering 608-612-0387 p.s. Big Boar BBQ and Catering has been voted #1 CATERER and #1 BBQ for 5 years in a row! >>FRIDAY'S SPECIAL<< The weather yesterday sucked! If you couldn't make it in to enjoy a Prime Rib Dinner, here is another way to enjoy our tasty Prime... ....a French Dip Prime Rib Sandwich! Sliced Prime piled into a toasted hoagie bun...YUMM! ( with a side of au jus sauce and bag of chips) Perfect for NOW or any other time today up till 8pm. Happy Friday! BIG BOAR. We're BBQ...& MORE! >>THURSDAY NIGHT SPECIAL<< Warm up your day with a fresh cut of our Prime Rib! PRIME RIB Dinners are served THURSDAY only from 4-8p! Choose The Original 12oz Cut $16.95 or The BIG 16oz Cut $21.95 Our Prime Rib is well seasoned & gently smoked to perfection so it is loaded with flavor. Includes your choice of potato, vegetable, bun and a trip to salad bar. You can even call ahead and take it to-go. Call 608-612-0387 Big Boar BBQ & Catering West Salem is BBQ & More! Amazing BBQ. I love the prime rib. Mildly smoked and super tender. I have never been there and not had the owner come out to make sure our food was perfect! >SATURDAY'S SPECIAL< TODAY get 20% off your BBQ Ribs at BIG BOAR BBQ! Thanks Jen for the great review! Leave a review of you own and let us know how we did at www.bigboarbbq.com/write-review Dine in and carry out available. ALL NEW Salads at BIG BOAR! We have added 4 different salads to our menu. Smoked Chicken Salad (top left) $7.75 Crispy Chicken Salad $7.75 Garden Salad $5.75 Chicken Garden Salad (top right) $7.50 Nothing beats a light and refreshing salad! Enjoy it here or take it to go. (608) 612-0387 We are BIG BOAR...BBQ & More! >TUESDAY SPECIAL< BURGER-BURGER! $1 Buck off BURGERS Every TUESDAY! Go ahead, be adventurous today and try something new! DINE-IN and CARRY-OUT Call ahead and we can have it ready for pickup inside or at our drive thru. (608) 612-0387 Big Boar BBQ & Catering... we're BBQ & More! >>SUNDAY SPECIAL<< The ULTIMATE PLATTER (incl. 4 Free Drinks) The Ultimate Platter lb. Pulled Pork- lb. Chopped Brisket- Smoked Chicken Rack of Baby Back Ribs - Choice of 3 Sides & 4 Slices of Bread Serves 3-4 People Sundays: Get 4 non-alcoholic drinks FREE with your purchase of the Ultimate Platter! Feed the Family for just $49.95! https://bigboarbbq.com/west-salem We're Big Boar BBQ & More! >>FRIDAY'S SPECIAL<< Celebrate this warm weather & treat yourself to our French Dip Sandwich TODAY featuring our Prime Rib pilled high on a grilled Hoagie Bun...and today you can grab one for $7.99! Comes with a side of au jus sauce and bag of chips. Perfect for Lunch or Dinner! Happy Friday. 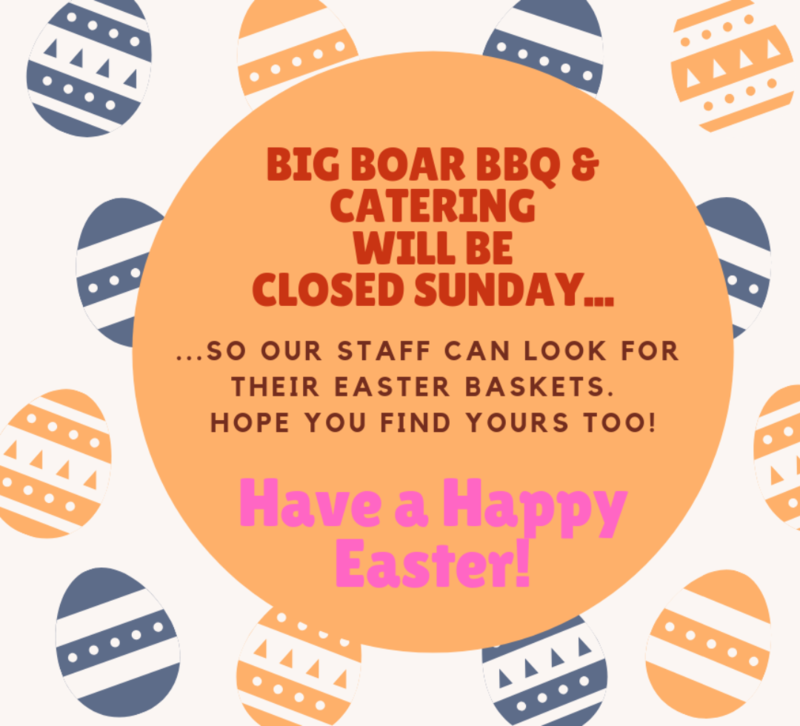 We're BIG BOAR BBQ & CATERING...and a whole lot more! THANK YOU to our customers for Voting for us "BEST OF" in the Explore La Crosse BEST OF LA CROSSE COUNTY 2019. We truly appreciate your support and are honored to have been chosen for BEST BBQ, BEST CATERER and a new category this year BEST RIBS!! #1 BEST BBQ 5 Years in a row (2019 - 2018 - 2017 - 2016 - 2015) #1 BEST CATERER 5 Years in a row (2019 - 2018 - 2017 - 2016 - 2015) #1 BEST RIBS an all NEW Category for 2019! At Big Boar BBQ we always put our own unique twist on flavors to make the most simple items taste special! Creating great BBQ is our Passion, Serving you is our Pleasure! We are Big Boar BBQ and Catering.....and More! >>FRIDAY'S SPECIAL<< Today you can get one of our TASTY Shaved Prime Rib French Dip Sandwiches for Only $7.99! We make a little extra Prime on Thursdays just for this sandwich! Slices of our well seasoned PRIME RIB Piled high on a toasted Hoagie Bun. Yum! Comes with a side of au jus sauce and bag of chips. You can personalize it with many different toppings or just keep it simple, your choice! Perfect for Lunch or Dinner! Happy FriYAY! We're BIG BOAR BBQ and a whole lot more! >>THURSDAY NIGHT SPECIAL<< PRIME RIB Dinner served from 4-8p! Come find out for yourself just how good our Prime Rib is! Your choice of 2 different cuts of Prime available! The Original 12oz Cut $16.95 And The BIG 16oz Cut $21.95 Our Prime Rib is well seasoned & gently smoked to perfection. Includes your choice of potato, vegetable, bun and a trip to salad bar. You can even call ahead and take it to-go. Call 608-612-0387 Big Boar BBQ & Catering West Salem is BBQ & More! >>TUESDAY SPECIAL<< Get a SPECIAL Price on our SPECIAL-T Burgers Every Tuesday! ALL BURGERS ARE $1 OFF EVERY TUESDAY. Call ahead for to-go orders (608) 612-0387 Big Boar BBQ & Catering... we're BBQ & More! Great food, reasonable price, and friendly staff. We are currently looking for outstanding individuals to join our Award Winning BBQ Crew! Looking for Full-Time Crew Members for all shifts. We are open 11a-8p daily. Perfect position for parents needing to drop their kids off at school in the morning. You get a FREE meal with each 8+ hour shift you work. If you're ready to earn a spot in a fast paced, energetic & fun environment apply today! Happy Tuesday! We've made our Tuesday Burger Special simpler! **ALL BURGERS ARE $1 OFF EVERY TUESDAY** DINE-IN OR CARRY-OUT Call ahead and we can have it ready for pickup inside or at our drive thru (608)612-0387 Big Boar BBQ & Catering... we're BBQ & More! Food was Great & service was Great also! The prime rib dinner was amazing, and the brisket and pulled pork was great as always!! Staff is always friendly and welcoming, love this place!! >>THURSDAY'S SPECIALS<< TWO for Thursday Specials! Both of these specials are only available on Thursdays since they are not on our regular menu. >Open Face Hot BEEF BRISKET Sandwich is available 11am-8pm. >PRIME RIB Dinner 4pm- 8pm (or when we sell out) Open Face Hot Beef Brisket Sandwich is Chopped Beef Brisket served up open face on Texas Bread with garlic mashed potatoes, gravy and vegetable. Nothing like a home cooked meal! PRIME RIB Dinner is available in 2 sized cuts! Original 12oz Dinner $16.95 Big Cut 16oz Dinner is $21.95 Well seasoned and gently smoked Prime Rib includes your choice of potato, a vegetable & salad bar. Big Boar BBQ & Catering...we're Great BBQ & MORE! >>MONDAY'S SPECIAL<< MEATLOAF served with mashed potatoes & gravy, vegetable, and a slice of bread for $8.95. Start your Workweek off right with some "comfort food" from Big Boar! Available dine in or to go. Call ahead and we'll have it ready for your pick up. BIG BOAR BBQ... We are BBQ & MORE! Food was excellent! We had prime rib and beef brisket. Quality service also. >>THURSDAY SUPPER SPECIAL<< How Hungry are YOU? That's the only choice you have to make! Your choice of 2 different cuts of Prime available tonight! The Original 12oz Cut $16.95 And The BIG 16oz Cut $21.95 Our Prime Rib is well seasoned & gently smoked to perfection. Includes your choice of potato, vegetable, bun and a trip to salad bar. You can even call ahead and take it to-go. Call 608-612-0387 PRIME RIB Dinner served from 4-8p! Big Boar BBQ & Catering West Salem is BBQ & More! Awesome as always. I just love the food !!! George St. Cook Shack is CLOSED for the Season.